JoAnne Edwards age 64 of Alma, MI, passed away Saturday, October 20, 2018, at Henry Ford Hospital, Detroit, MI. Funeral Services will be held at Forest Hill Church of Christ, Alma, MI on Thursday, October 25, 2018 at 1:00 P.M., with Mr. John Robinson officiating. Burial will take place at Chapel Garden Cemetery, Seville Township, MI. Visitation will be held on Wednesday, October 24, 2018 from 2-8 P.M. with family present from 2-4 & 6-8 P.M. at Smith Family Funeral Homes St. Louis, MI. JoAnne was born in Alma, MI on March 6, 1954, the daughter of Roland Seyright and Lucille Bell (Towersey) Koutz. JoAnne married Randy Edwards on October 12, 1974 in Forest Hill, MI. 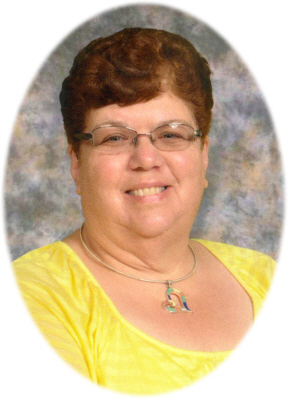 JoAnne was a Paraprofessional at Alma Middle School. The kids at the school were very important to her. She was an active member of Forest Hill Church of Christ her entire life. JoAnne loved spending time with her children, grandchildren and family. JoAnne is survived by her husband Randy Edwards of Alma, MI; 3 sons: Brian and Nanette Edwards of Whitmore Lake, MI; Jason and Karen Edwards of Tipp City, OH; Chad Edwards of Alma, MI; daughter Tiffany Edwards of Alma, MI; 8 grandchildren: Elijah, Emma, Emelia, Sophia, Eilee, Connor, Evelyn, and Kolton; sister Kathy and Gary Thigpen of Ithaca, MI; brother Randy and Diane Koutz of St. Louis, MI; brother Dave and Karen Koutz of Alma, MI; sister Crystal and Dave Derfelt of Naperville, IL; sister Donna and Dave Best of St. Louis, MI; sister Tammy and Bob Mclachlan of Midland, MI; brother Roland and Alice Koutz of Breckenridge, MI. She is also survived by many nieces and nephews. JoAnne was preceded in death by her parents, grandson Judah Edwards and nephew Steven Koutz. Memorials may be made to Forest Hill Church of Christ. Online condolences can be sent to www.smithfamilyfuneralhomes.com. The family is being served by Smith Family Funeral Homes, St. Louis, MI.